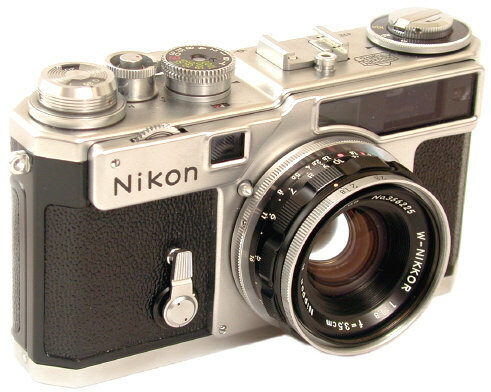 The 35mm f/1.8 Nikkor was the fastest Nikon wide angle for rangefinder cameras. It was also a superb performer, earning a favorite status with many shooters. Introduced in 1956, it is a 7 element design, with f/stops down to f/22, a close focus of 3.5 feet, and uses 43mm filters. Most photogs saw little need to buy a hood with the recessed front lens design, making 35mm f/1.8 lens shades rather difficult to find for today's collectors. The first 100 or so had an all black aperture ring, which was quickly replaced with chrome. Per Bob Rotoloni, about 6,500 were made in Nikon mount, about 1,500 in Leica screw mount. 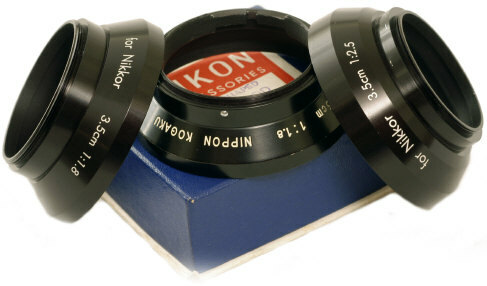 Unlike the 25/4 Nikkor, the 35mm f/1.8 can be focused with either the lens barrel or the focusing wheel. Like most Nikon rangefinder lenses, turn the lens and the body helical to infinity before mounting or dismounting lenses. The later black 35 Nikkors in Nikon rangefinder mount (like all NRF wides) are also usable on classic Zeiss Contax rangefinders (not modern G series). The black lenses are considered more desirable today by collectors than their earlier standard chrome counterparts due to aesthetics and lighter weight. Leica screw mount Rangefinder Nikkors often have different lens barrels than their Nikon Rangefinder mount counterparts. Pictured here is a rare Nicca made Tower Type 5 Leica copy (with its peculiar side hinged back) mounting a 35mm f/1.8 Leica mount Nikkor with the Abrahamsson 43mm 35/2.5 hood. 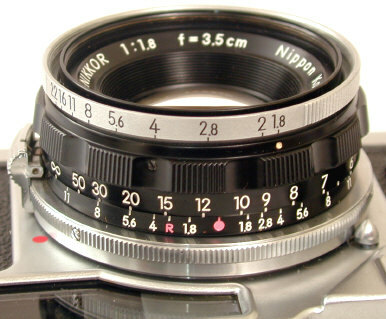 While the Leica mount 35mm f/1.8 Nikkor shares the same glass as the Nikon Rangefinder mount version shown at the top of this page, notice the lens barrel is entirely different. By the way, in my opinion the current metal Voigtlander 35 brightline finder shown here is easily the best 35mm brightline finder ever made by any camera manufacturer. Revised: September 12, 2017 . Copyright © 1998-2004 Stephen Gandy. All rights reserved. This means you may NOT copy and re-use the text or the pictures in ANY other internet or printed publication of ANY kind. Information in this document is subject to change without notice. Other products and companies referred to herein are trademarks or registered trademarks of their respective companies or mark holders.